– The Nigerian Bar Association (NBA) has been urged to boycott all the courts in the country – This is the submission of Lagos-based lawyer, Ebun-Olu Adegboruwa – Adegboruwa was reacting to the overnight invasion of judges’ homes by the Department of State Security (DSS) Popular Lagos-based legal practitioner, Mr Ebun-Olu Adegboruwa has urged the NBA to boycott all the courts in the country due to the overnight invasion of judges’ homes by the DSS. 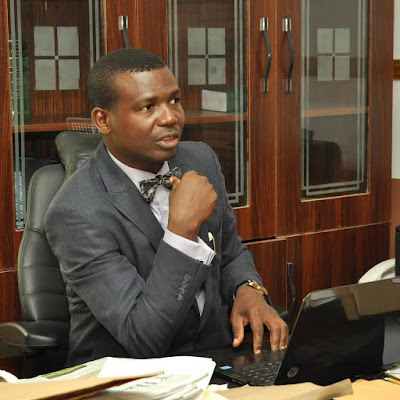 Popular Lagos-based legal practitioner, Mr Ebun-Olu Adegboruwa has urged the NBA to boycott all the courts in the country due to the overnight invasion of judges’ homes by the DSS. In a statement made available to journalists today, October 8, Adegboruwa described the action of the security agency as “full blown dictatorship”. “It is now a case of anarchists in power. The clampdown on judges has been on for a long time, through agents of government in the various institutions of oppression. “We are now back to the 1984 jackboot system of intolerance, where all dissenting views and opinions must be silenced. “It is condemnable for the DSS, which is an arm of the executive, to be breathing down on the judicial arm of government, under the guise of fighting corruption. “It is meant to silence the opposition and to cover the inefficiency and cluelessness of this administration,” part of the statement read. Adegboruwa also referred to the 1999 Constitution in sections 4, 5 and 6 which prescribes the system of separation of powers between the three arms of government. He also opined that the present administration is hell-bent on intimidating other arms of government through its actions. “Since 2015 when this government was sworn in, the executive arm under General Buhari has dominated and brutalized the other two arms of government. The leadership of the National Assembly is under trial and it is now the turn of the judiciary. “It is in this regard that the mindless invasion of the homes of judges by the DSS is totally condemnable. “It should never happen that the executive is indirectly threatening and intimidating members of the third estate of the realm. “As judges have no voices to speak officially, I call on the Nigerian Bar Association to declare an indefinite strike so that all courts of law in Nigeria will be boycotted until there is respect for the rule of law and the Constitution, commencing from Monday, October 10, 2016, until further notice,” Adegboruwa added. Supporting Adegboruwa’s call, another Lagos-based lawyer, Barrister Uduak Ekott described the action of the DSS as a “clear case of executive recklessness.” Ekott who spoke to NAIJ.com on the issue said there are channels to be followed when there are allegations of corruption against any serving judge. “It’s a sad day for democracy in Nigeria and the independence of the judiciary is threatened. I support the call for a boycott of courts by fellow lawyers,” Ekott added. In the same vein, former aviation minister and erstwhile spokesperson for the Goodluck Jonathan presidential campaign organization, Femi Fani-Kayode says Nigeria is in trouble following the abduction like arrest of judges across different states by operatives of the DSS. Reacting through a statement made available to NAIJ.com, Femi Fani-Kayode said it is time for Nigerians to stand up against the Buhari led APC government. Nigerians soldiers are Lunatics and cowards just as the case today, 08 of October,2016 at "Iwaji and Iriji" festival at Obosi a known community in Anambra State it was about 3:35 pm, a patriotic biafra man who came flying Biafra flag at the scene of the ceremony where hundreds of people gathered was attacked vividly by the Nigeria soldiers who brought the flag down and gave the man thorough bitten he never had in his life, took him into their hilux vehicle and when there were about to zoom off from the arena unfortunatly we ran into them ofcourse their were set to fire because we had camera on us they only got scared us with their guns and with this we ran into a nearby compound to safeguard our lives it was this time they began shooting into the air because of the crowd they thought would descend on them immediately ran away, honestly it was horrible though no life was taken .I do like you to further investigate on this attack so that you know is a true. Am a press man, me and my crew got into them face-to-face. Nigerians soldiers are Lunatics and cowards just as the case today, 08 of October,2016 at "Iwaji and Iriji" festival at Obosi a known community in Anambra State it was about 3:35 pm, a patriotic biafra man who came flying Biafra flag at the scene of the ceremony where hundreds of people gathered was attacked vividly by the Nigeria soldiers who brought the flag down and gave the man thorough bitten he never had in his life, took him into their hillux vehicle and when there were about to zoom off from the arena unfortunately we ran into them of-course their were set to fire because we had camera on us they only got scared us with their guns and with this we ran into a nearby compound to safeguard our lives it was this time they began shooting into the air because of the crowd they thought would descend on them immediately they ran away, honestly it was horrible though no life was taken .I do like you to further investigate on this attack so that you know is a true story . Am a press man, me and my crew got into them face-to-face.